The original ending of 'Frozen' was a lot more twisted. By now, we've probably all seen Disney's Frozen. The film skyrocketed to popularity when it was released at the end of 2013, and it hasn't looked back. As it is, the film is a heartwarming story about the bond between sisters, but it turns out the original version of the script had a much darker ending. 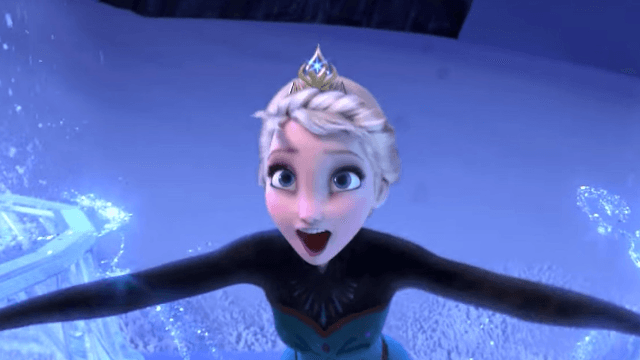 Kristen Bell, who voiced Anna in the film, has already revealed to fans that Elsa was a more straightforward villain in earlier iterations of the Frozen script. According to Entertainment Weekly, Anna and Elsa weren't related in earlier drafts of the script, nor were they royals. They were merely a pure-hearted heroine and an evil snow queen, respectively. Originally, the film was supposed to open with a prophecy that warned of “a ruler with a frozen heart will bring destruction to the kingdom of Arendelle." Elsa was scorned when the man of her dreams left her at the altar, and froze her own heart so she'd never love again. (YIKES. Heavy.) So, both she and the audience are meant to believe that she's the villain the prophecy warns of. In the original ending, Elsa creates an army of snow monsters to send after Anna and her love interest, Kristoff. The two-faced Prince Hans triggers an avalanche in order to stop Elsa's army, not caring that he's also put Elsa, Anna, and the entire kingdom in danger. Anna realizes that Elsa may be the kingdom's only hope, and convinces her to use her powers to stop the avalanche. Peter Del Vecho, one of the film's producers, said that they decided to change that storyline when they realized it wasn't original enough. When the decision was made to make Anna and Elsa sisters, the script was reworked and the ending we know and love was born. WHEW. I don't know about you, but I like the film the way it is. And if I may, I'd like to take a moment to salute Frozen's most underrated character, the shopkeeper who's holding a "big summer blowout" sale. He is the funniest part of this movie. Do not try to fight me on it.